Archives for April 12th, 2017 | SmashToast, Inc.
Smart Home Market Size & Share will hit $53.45 Billion by 2022! The global smart home market is expected to grow at a CAGR of 14.5% between 2017 and 2022. The market revenue of $24.10 billion in 2016 is expected to grow up to $53.45 billion by 2022. The advanced technology has enabled various devices to be connected and controlled by one device and this technology is used by smart homes. In smart homes, various devices such as lighting, AC, CCTV cameras, smart TV, washing machine, etc., can be controlled by either a remote or a smartphone or tablet. These devices can be switched on or off from a different location even if the device controlling them gets a signal for the same. Homeowners are enjoying more convenience and comfort from basic security monitoring and customized access to window coverings, appliances, lighting, irrigation, entertainment systems and many others.Prominent drivers of smart home adoption are energy efficiency, home security, entertainment, convenience/productivity, remote health monitoring and connectivity. 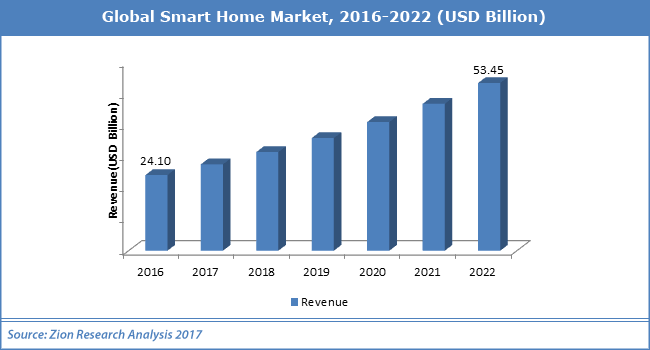 The major growth driver for the smart home market includes growing awareness among consumers about energy consumption, growing the aging population, rising disposable income in developing countries, and government initiatives among others.In addition, rising demand for home healthcare is fueling the growth of the smart home market. However, high prices coupled with limited consumer demand and long device replacement cycles are top barriers preventing the smart home market from moving from the early-adopter stage to the mass adoption stage. Segmentation of smart home market is done on the basis of product and region. The products involved in the smart home market are the smart kitchen, home healthcare, lighting control, HVAC control and others. Light control held the largest share in the smart home market due to reduced electricity consumption in homes. Lighting sensors adjust the intensity of artificial light according to the intensity of natural light thereby reducing power consumption.